Welcome to the page for existing customers who have ordered from us already. Thank you for coming back to us and letting us share your journey with you as your family grows. 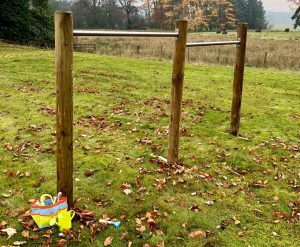 We hope to be able to help you with any questions about your play equipment that may have arisen and have some top tips for you that you might not already know about! Firstly – please share your pictures with us! 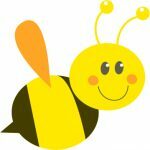 If you are happy to share a picture of your play frame and family we’d love to see them. Send them directly to susie@caledoniaplay.com or tag us in on social media. 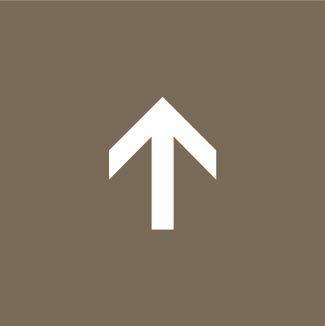 We have organically accumulated a considerable following on Pinterest and have ‘Pin It’ buttons on all our products to enable you to add them to your favourite boards and wish lists. 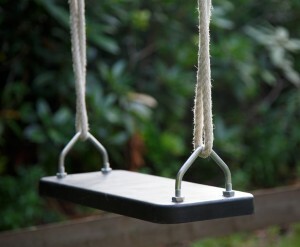 Our top selling online product this month has been the Deluxe Swing Seat. It is made of black rubber and is often thought to be more comfortable than the timber seat as the soft surface adds a little more grip. If you don’t already have one why not get one and switch it up a little with the swing seats just for fun? Our Tumble bars are becoming more and more popular. 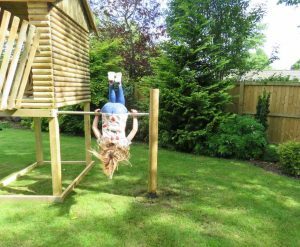 There are three ways that you can have a tumble bar in your garden. 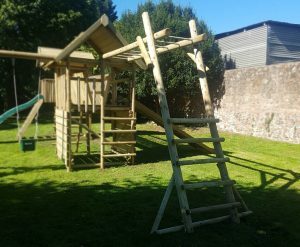 Add it on to an existing product such as the Garden Play Fort or the Garden Play House. This is the TBR tumble bar and has one single post which is sunk into the ground for stability. The stainless steel bar then joins onto the side of the existing play equipment. The Standalone Single Tumble Bar TBR-S has two upright posts with the smooth stainless steel bar in between. 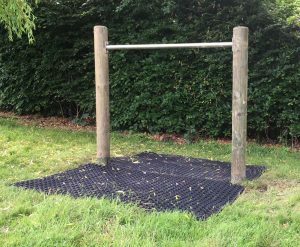 The stainless steel cross bars have a very smooth finish for easy tumbling and can be set at any height between 0.9 and 1.3m. Just ask! Finally – the Standalone Double Tumble Bar TBR-S2 is twice the fun! You can install these yourself or have one of our installation teams come out and do it for you. Email info@caledoniaplay.com for more information. Have you seen one of our newest products? Our Mango Orange Bonsai Cacoon is a must for every garden. 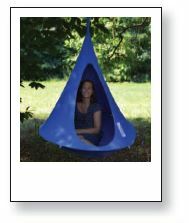 It is a unique pod that can be suspended in a variety of places including our swing frames or simply hang it from a large tree branch! Easy to assemble and install our Mango Orange Bonsai Cacoon makes the perfect gift for those children who just loves the idea of relaxing and enjoying a quiet space while the world and the clouds drift by. Relocating? Take a look at our moving services information – let us take the stress out of moving the play equipment to your new place. If you have any questions about your product, aftercare or maintenance, please email info@caledoniaplay.com. Add-ons are products that can be added on to many existing products either at the time of purchase or at a later date. 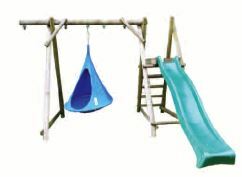 For example – a Climbing Rock Wall can be added onto the side of a Garden Play Fort, or a Slide Frame can be added onto our Swing Frames. There are many configurations possible so please email info@caledoniaplay.com if you would like advice. Alternatively call the office on 01577 840570 and we will be able to help you choose the products that work best for you. Our products are sold with a one-year warranty against manufacturing faults. There is an extended warranty of seven years against rotting timber. Cracks and Splits will appear in the timber as it expands and contracts with the changes in weather and temperature. This is normal however we do understand that it may cause concern particularly when it is on children’s play equipment which we all want to be completely safe. Read some more information about this here. If you are still concerned then please send us an email to info@caledoniaplay.com with details about your product and images of the cracks you are concerned about. 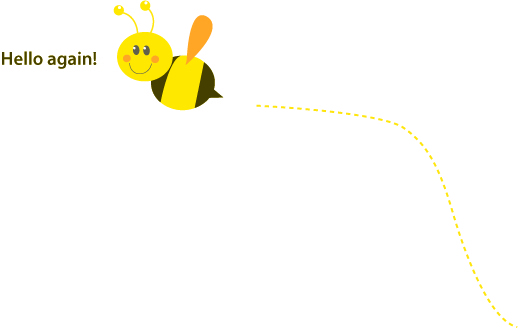 Alternatively, call us on 01577 840570 to discuss.